KHON2 has been telling you how Honolulu police are looking for new recruits. Now the Kauai Police Department is also hiring and it’s even looking to the mainland for potential candidates. 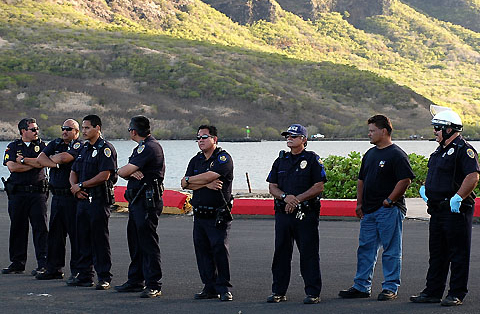 Kauai has the smallest police force in the state, but they say don’t be fooled by their size. “If you want to help make a difference, this is the place to do it,” KPD Chief Darryl Perry said. “We’re not that ominous figure… police officer… where people say if you do something bad we call police. We don’t want that mindset. We want to be open, and honest, and make sure the community has trust in and confidence in us that we’re doing the right thing,” Perry said. The department has 12 vacancies to fill. To attract outsiders, it has put together a commercial not only highlighting life on the job, but also life on Kauai, an island known for its natural beauty. However, as dreamy as the commercial makes it seem, being a police officer in paradise takes guts and critical thinking. It’s something KHON2’s Brigette Namata learned first-hand as she was suited up and put through some of the same tests recruits are put through. She learned that sometimes you have to make split decisions to keep the public safe. The training is intense – but also expensive. Training for each recruit comes at a price tag of $150-thousand dollars.